The one thing that almost no one ever talks about in business is that the process of making things happen. In my experience taking action has almost ALWAYS worked out better for me than just messing about “planning” what I should do next. Now don’t get me wrong – I am a championship planner, over-achiever and over-analyzer! I can spend virtually days, weeks, even years, plotting the perfect course of action – only to sit back and never get anything worthwhile done! But if I am facing a critical make-it-or-break-it deadline or literally have disaster looming over my shoulder then I will jump right in it – with both feet and my eyes closed! You would think that these ‘desperate measures’ would be mistakes, right? Yet I started to notice that it was during these moments of “act now – clean up your mistakes later” that I got some of my best work done. So I started wondering why taking action without a whole lot of prior planning could be so much more successful for me in those instances. 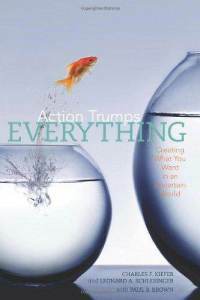 This was when I discovered this super cool book: “Action Trumps Everything – Creating What You Want in an Uncertain World” by Charles F. Kiefer. In this book, Kiefer explains that when you have all the information about a particular situation, you can easily “plan” out your work and get the results you expect. For example, say you run a dog training and pet-sitting business. You know from looking at your past records and experience that 3 to 5% of your dog training clients will want to sign up for your pet-sitting services. It’s this consistency and predictability that allow you to successfully plan your pet-sitting business and make it a success. Need more money, then just do more of what you have done in the past. But what if you have NEVER offered a pet-sitting service before? Now what? How should you promote this new service to your current training clients? How many of them will take you up on your offer? How many pet-sitting clients do you need to break-even? Do you need to hire extra help or can your regular staff handle this? Do you need any special gear to do this? Do you need to be licensed, insured or bonded for this in your local area? It’s this type of untested business situation where normal planning crashes and burns! Nothing is proven and you don’t have a record of success or past history to fall back on. See, all the planning and information gathering in the world can only help you so far when things are in the deep, dark ‘unknown’. Sure, you can do your homework and learn about the experiences from others. While this research can be extremely helpful – you and I both know every business is unique and every business owner handles things in their own way. But in the end, you simply don’t have any way to know if pet-sitting will actually work for you or not. It’s because of this uncertainty, you may start a new project full of hope, planning your course of action, only to stumble and fail because of unseen and unexpected obstacles. These stumbling blocks are often ‘knowledge gaps’ and they can screw any attempt to plan things and forge ahead. After all, how can you plan for something, if you don’t know it exists? So if planning doesn’t work, what can you do? This is where taking action and making things happen becomes so important. 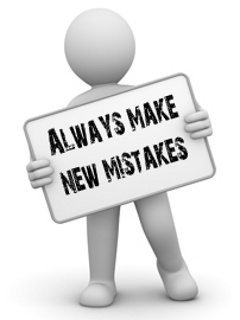 Without predictable past behaviors or records, you really do have to ‘leap before you look’! And it’s this taking action – while still being uncertain that makes small business seem so risky to the average person. It also why everyone mistakenly thinks successful entrepreneurs are “risk-takers”. But are successful entrepreneurs like Bill Gates, the late Steve Jobs, or Donald Trump, along with all the folks on television’s popular ‘Shark Tank” show really risk-takers, gamblers and adrenaline junkies? Hmm … actually that would be a NO. According to Kiefer in his book, “Action Trumps Everything” successful entrepreneurs seem to use a process of taking action using a series of “small steps” to test out every new start-up or project BEFORE totally committing themselves. 1. First, entrepreneurs come up with an idea that looks like it will be profitable. 2. They break the project down into progressive ‘baby steps’ and then they take action on those small steps – one at a time. 3. Next they check their results and then evaluate where that ‘baby’ step has led them. 4. They then focus on the next ‘baby’ step that leads them toward their goal. 5. They always track their process and have preset criteria (usually time or money) to determine whether they should quit or go on. 6. They use these preset limits to decide what success or failure looks like – to them.This way they keep themselves from falling in love with a project that is taking up much time or money to be profitable. Or from quitting one too early, because they are impatient or because things are getting dull and boring. If you are like me, you might have been a bit surprised at some the slow and cautious “Turtle” like behavior Kiefer book has uncovered about entrepreneurs. But now that I look back at those past situations where action did beat everything, frequently after “jumping in” to avoid disaster, I would automatically slow down. Kind of like someone trying to cross a frozen river – you wish you could find a good bridge. But if you can’t you move as fast you can on tiptoes, taking one tiny step at a time until you get across or diving for safety the second you hear cracking ice or see dark water! So the next time you are start a new business project, don’t be afraid to be like Bill Gates or me! Use the steps above to slowly navigate your way to success.